First of all you need to soak your feet in warm water. Soaking in warm water will soften dry or calloused skin. Take small bucket or tub and fill with warm water (not too much warm). Add 1/2 cup of sea salt or epsom salts and 1 lemon juice. You can also add some rose petals for extra fragrance. After soaking of 15-20 minutes rub your feet with pumice stone in circular motions and then pat dry your skin. After foot soaking in warm water your next step is foot exfoliation with a scrub. 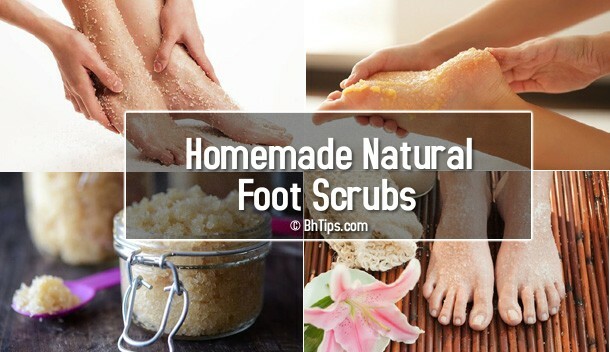 Best homemade and natural foot scrub recipes are given below, you can choose one of them to exfoliate or scrub your feet. Honey deeply moisturize your skin. Sea salt gently exfoliates and removes the dead skin cells. Almond oil not only creates a natural glow but also helps a lot to get a bright and beautiful skin. To make this scrub at home you need the given ingredients. Mix all above ingredients to make a coarse paste. Apply to your feet in a circular motion until salt starts to dissolve. Let it stay for 3-5 minutes. Sugar gently exfoliates the dead skin cells. Skin bleaching properties of lemon juice are highly beneficial to lighten the skin tone. Coconut oil naturally moisturize your feet as well as gives you soft and glowing feet.To make this scrub at home you are required the given ingredients. Mix all above ingredients together to make a rough paste. Apply to feet in a circular motion until sugar starts to dissolve. Let it stay on feet for 5-10 minutes and then rinse off with lukewarm water. Skin exfoliating properties of coffee and sugar along with skin moisturizing properties of coconut oil, help a lot to get soft and beautiful feet even at home. To make this scrub you need the given ingredients. Let it stay on feet for 3-5 minutes. Oatmeal absorbs the skin impurities along with dirt and dust. Brown sugar gently exfoliates your dead skin cells. Honey deeply moisturize your skin and creates natural glow. Bleaching properties of lemon juice not only lighten your skin tone but also helps a lot to you you an even skin tone free from dark patches. Olive oil is a rich source of anti-oxidants which not only fight against skin damaging free radicals but also prevent from premature wrinkles and skin aging. To prepare this scrub at home you are required the given ingredients. Put all the ingredients into a small bowl. Mix them together to make a coarse paste. Massage into your feet in a circular motion. Rub well into your heels to smooth any rough patches. Finally rinse with warm water. Salt along with cornmeal gently exfoliate your skin to remove dead skin cells along with sticky dirt and dust particles. Almond oil not only moisturize your skin but also helps to make it fair and glowing. You can prepare this scrub even at home. All you need is to arrange the given ingredients and follow the given instructions. Mix all ingredients together to make a rough and coarse Mixture. When salt starts to dissolve then leave the massage. Finally wash your feet with lukewarm water. Skin moisturizing and healing properties of aloe vera gel, makes it a great addition in foot scrub recipe for fair and glowing skin. Oatmeal along with cornmeal and sea salt exfoliate and removes dirt, dust and skin impurities along with dead skin cells. While almond oil being a rich source of anti-oxidants not fight against skin damaging free radicals but also helps a lot to give you a younger looking and bright skin. You can prepare this scrub simply at home by mixing the given ingredients in accordance with the given instructions. Pour all the ingredients into a bowl and mix them well to make a coarse mixture. Now apply to feet in a circular motion until salt starts to dissolve. While apply pay special extra attention to your heels. Strawberries are rich source of anti-oxidants which are very helpful to fight against skin damaging free radicals and prevent from early signs of aging. Coarse table salt or Sea salt gently helps to remove dead skin cells along with skin impurities. While Olive oil not only deeply moisturize your skin but also brings natural glow. Massage your feet, paying special attention to your heels. Finally rinse off using lukewarm water. After foot exfoliation with a natural scrub, moisturizing is essential to avoid dryness. Apply your favourite moisturizer or simply apply olive oil and wear cotton socks throughout the night. This will help your feet absorb the moisture. Next morning when will you wake up you feet will be really soft, smooth and glowing.